As demonstrated in the latest Batman: Arkham Knight video from Nvidia, doing doughnuts with the Batmobile without GameWorks is an empty, soulless experience. As if the effect of interactive smoke and fog weren’t driven home enough in last week’s GameWorks video, here Nvidia literally drives it home, using Batman’s ride as an example of how good a video game can look when you add enormous amounts of smoke for some reason. Here is a video I found on YouTube of a real car doing a real doughnut with real tire smoke. 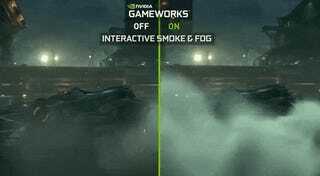 And here is Nvidia’s GameWorks video, demonstrating smoke popping from firing weapons and billowing in great, meaty clouds from Batman’s magical smoke-producing tires. Damn. Even real life cannot compare to GameWorks. It’s kind of depressing, really, but I guess it jibes with Nvidia’s new GameWorks slogan I just made up: If It’s Not GameWorks You Should Probably Just End It All—There’s No Point Anymore.